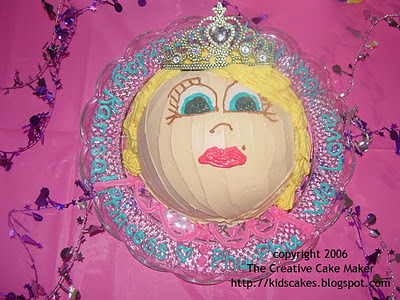 This “Princess” birthday cake is a fun cake-decorating project that doesn’t take much more than cake mix, some store bought icing and a tiara from the dollar store. I knew my cake decorating skills had reached some sort of family success when my best friend, a very picky woman, told me all she wanted for her birthday from me this year was a "Princess Cake". I had to oblige. This one turned out looking like a playmobil anime figure. I received a Betty Crocker Bake 'N Fill dome cake mold the previous Christmas and had been trying to figure out what I could make with it that was a little bit unusual. I didn't fill this one with pudding or cream. I made the layer cake option. 1 standard box of cake mix (whatever flavor you prefer), baked. You will only need one round layer for this cake so I usually make 12 cupcakes with the extra cake mix. 3 containers of vanilla/white icing – one container colored the desired skin tone, one container colored the desired hair color, and the remaining container will be made into an assortment of colors for the eyes, lips, and any message you may want to write on the cake. Leave about 2 tablespoons of icing white. If you have not already done so, bake your dome cake according to the pan directions. The cake shown is made using the layered cake instructions. You can also choose to use the filled cake instructions. Cool your cake completely. If it is not cooled, your icing will start to melt and slide off the cake. Ice the layers together or fill the cake as directed on the pan instructions. Place your cake right side up (dome side up) on the plate you will display it on. If you prefer, you can place your cake on a cake board and move it to it’s permanent home once it is completed. However, most of us don’t have cake boards handy. The cake pictured here is resting directly on a large glass serving plate. To decorate, first ice the entire dome with the skin colored icing. I made the skin tone shown in the picture using yellow coloring with just a touch of red. Try to smooth the icing out as best you can. I used an hors d’oeuvre maker to pump out the hair. It made "spaghetti" looking curls all over the head. You could use a sandwich bag to make continuous single curls everywhere. To do this, fill a Ziploc sandwich bag (or similar brand) 1/3 full with some icing. Push the icing toward one of the bottom corners of the bag. Snip a small hole in the corner of the bag with your scissors. Twist the excess bag to create a decorating “piping bag”. Place the “twist” in the joint between your thumb and the rest of your hand. Close your hand over the rest of the bag. To decorate your cake, you will squeeze the bag. Try it a little on some wax paper to get used to it. To make the task of piping the “hair” onto the cake easier, I just went with plain yellow hair. I thought about putting some chocolate icing in the bag, to give the hair a more "highlighted" look. Get creative with it. If you are making your princess a brunette, add a little yellow or red to the icing to create highlights. To outline the eyes and make the nose and beauty mark, use a sandwich bag with a small hole cut in one bottom corner. Fill it with brown or some other color slightly darker than the skin tone color. If you have some of the skin toned icing left over, add some coloring to it to achieve the shade you want. For the lips, color a small amount (about a tablespoon) of icing a shade of red or pink. Outline the lips first and remember to start small. It is easier to add fullness to the lips rather than to make them less full. You can also you’re the same color to add a ruffled collar at the base of the cake on the plate, however, you will need to have additional icing colored for it. When filling in the eyes, start with the iris color. Blue seemed like a nice color that would brighten up the cake. Green or violet would have worked, too. Outline the area you want colored first. Then fill it in. Once you have the iris made, you can fill in the pupil with black. For my black color, I started adding some of my leftover colors together until a dark gray, almost black shade was made. Fill in the remainder of the eyes with white. Because this cake does not have a lot of room for messages, I wrote the message with extra icing around the cake on the plate. 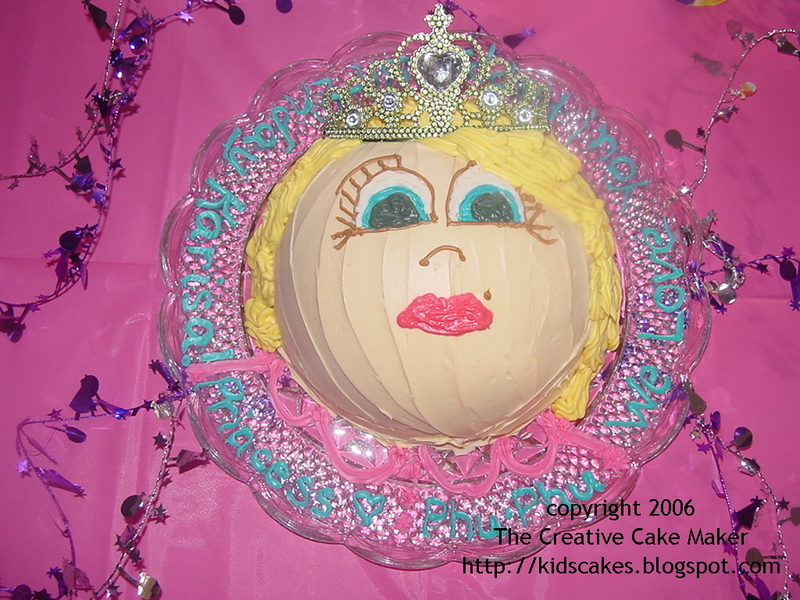 The tiara is the final addition to your princess cake. Be sure to wash it well in hot soapy water and rinse thoroughly before placing it on the cake. If you are making this for a pre-teen or someone else older than a few years, you could use a crown of candles instead of a tiara. Another possibility is to make dollops of icing going around the cake and put candles in them. Place the candles in the icing before it hardens.